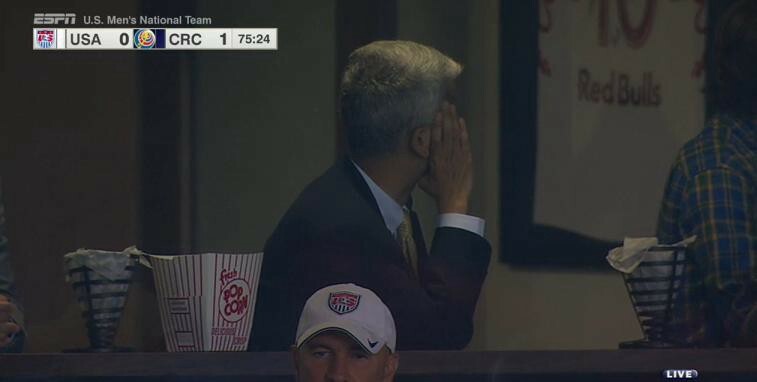 It’s easy to point fingers at Jurgen Klinsmann right now. The U.S. have lost two consecutive matches of significance and he seems to be doing everything wrong. This is a problem. But the U.S. federation has a bigger problem. Namely, USSF president Sunil Gulati. If U.S. Soccer was a horror movie, Gulati would be the character that hides under the bed, hoping the undead axe murderer gets bored, goes home and starts a new life as a tax attorney. His method of leadership is to provide no leadership at all. And it’s causing a growing number of embarrassments on both the men’s and women’s sides of the game. The Klinsmann situation is a comparatively minor concern in the grand scheme of issues facing the USSF. World Cup qualification is still a strong possibility and though he isn’t getting results at the moment, Klinsmann has brought a number of promising young talents into the mix that beget optimism for the future, whether Klinsmann himself is part of it or not. Still, the losses to Mexico and Costa Rica and the avalanche of calls for Klinsmann to be fired that ensued demanded a show of leadership. Either sack him now, since time is of the essence in the middle of a World Cup cycle, or confidently back the manager in an effort to quiet the unrest both outside and inside the dressing room. Instead, Gulati has given the equivalent of a verbal shrug. (Cont): Gulati also said he would do review of situation and was "disappointed" in result. My opinion? JK will stay. Gulati likes stability. If it’s decided that Klinsmann must go now, Gulati, who isn’t up for re-election until 2018, will be on the hook for the considerable expense that decision will bring to the federation. After all, he was ultimately responsible for offering Klinsmann a four-year contract extension shortly before the 2014 World Cup that also gave him the broader role of technical director. Meanwhile, the issues on the women’s side go far beyond wins and losses, though they too are coming off a shocking quarterfinal loss to Sweden at the Rio Olympics. The women’s team has been actively fighting for equal pay for months and several members of the team filed a lawsuit against the federation back in March. When asked about this by Sports Illustrated’s Grant Wahl, Gulati proved that he is more comfortable in his role as an economics professor at Columbia University than as the leader of a non-profit organization. Gulati added that revenue generation is “absolutely part of the equation,” but doesn’t seem to entertain the possibility that maybe it shouldn’t be. Again, the USSF isn’t a publicly traded corporation. It’s a non-profit organization (then, so is FIFA) with the stated mission of making “soccer, in all its forms, a preeminent sport in the United States and to continue the development of soccer at all recreational and competitive levels.” And equal pay seems like both a just and logical way of working towards that mission. Instead, this battle has been allowed to fester. And when the USSF terminated Hope Solo’s contract after she called Sweden’s team “cowards,” it seemed a lot more likely that she was being cast off for being one of the team’s leaders in the equal pay movement than for being a sore loser. This brings us to Gulati’s recent comments on Megan Rapinoe kneeling during the national anthem while on international duty. Depending on how you read that quote, it’s either an indirect threat to Rapinoe and anyone else who doesn’t toe the line or it’s a mealy mouthed attempt to placate those offended by her actions. Or maybe it’s both. Whatever the case, it’s another example of Gulati hiding under the bed. He’s not punishing her and he’s not backing her. He’s hoping his word smoothie will be enough to get everyone to argue amongst themselves and leave him alone. A clearer example of this desire was when a Senate subcommittee called USSF representatives to be questioned about the FBI’s crackdown on FIFA and the U.S.’s own confederation—CONCACAF—based largely on the crimes perpetrated and exposed by turncoat American FIFA executive Chuck Blazer. Gulati declined to attend and has remained steadfast in attempts to quietly distance himself from the corruption that has gone on all around him. The problems of Gulati’s reign are not limited to the highest levels of the sport, though. 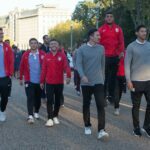 They also extended down to the youth ranks, corroding the very foundation upon which U.S. Soccer is built. The pay to play system of youth soccer in America predates Gulati’s tenure atop the USSF, but the lack of action to remedy it has allowed it to worsen and affect exponentially more children. And yet, the inescapable theme of avoidance holds true. Obviously Gulati can’t be expected to fix all that ails U.S. Soccer by himself, but being a leader who leads, rather than someone who enjoys all the perks of his title while shirking its toughest responsibilities and facing no opposition to his crown would be a good start. And if he’s not willing to do that, it’s time to find someone who is. Hey—maybe Jurgen Klinsmann would be a better federation president than national team coach.